scrap thrown in his direction usually bounced unseen off his head. Yet put a pork roast in the oven, and the guy still breathed as audibly as an obscene caller. The eyes and ears may have gone, but the nose was eternal. And the tail. The tail still wagged, albeit at half-staff. When it stops, I thought more than once, then we'll know." Heartening and bittersweet," Good Dog. 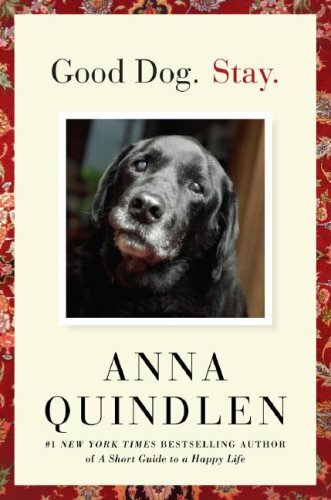 Stay," honors the life of a cherished and loyal friend and offers us a valuable lesson on our four-legged family members: Sometimes an old dog can teach us new tricks. Author Anna Quindlen was born in Philadelphia on July 8, 1953. She graduated from Barnard in 1974. Quindlen worked as a reporter for the New York Post and the New York Times and wrote columns for the Times. She won the 1992 Pulitzer Prize for Commentary before devoting herself to writing fiction. She has written both adult fiction (including Object Lessons, Black and Blue and One True Thing, which was made into a motion picture starring Meryl Streep) and children's fiction (Happily Ever After and The Tree That Came to Stay).